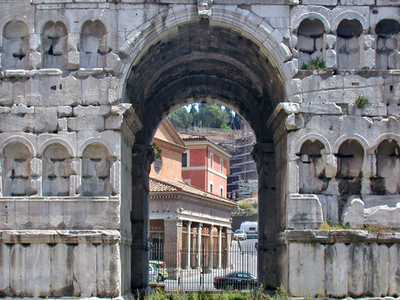 The Arch of Janus is the only quadrifrons triumphal arch preserved in Rome, across a crossroads in the Velabrum-Forum Boarium. It was built in the early 4th century, using spolia, possibly in honour of Constantine I or Constantius II. Its current name probably dates from the Renaissance or later, and was not used to describe it in classical antiquity. The name is derived from the structure's four-fronted, four-arched configuration; relating this to the four-faced version of Janus (Ianus Quadrifons), as well as to actual Janus-related structures mentioned in historic descriptions of ancient Rome. In the Middle Ages, the Frangipane family transformed the building into a fortress, and so it survived intact until 1830. Then, the attic and top were torn down because they were erroneously believed to not belong to the original structure. Fragments of the dedicatory inscription are still preserved inside the nearby church of San Giorgio al Velabro. Here's the our members favorite photos of "Monuments in Rome". Upload your photo of Arch of Janus!